Scientists inspired by these sophisticated molecular machines want to build their own, with forms and functions customized to tackle modern-day challenges. The ability to design new protein nanostructures could have useful implications in targeted delivery of drugs, in vaccine development and in plasmonics, which is manipulating electromagnetic signals to guide light diffraction for information technologies, energy production or other uses. “Proteins are amazing structures that can do remarkable things,” King said, “they can respond to changes in their environment. Exposure to a particular metabolite or a rise in temperature, for example, can trigger an alteration in a particular protein’s shape and function. ” People often call proteins the building blocks of life. “But unlike, say, a PVC pipe," King said, "they are not simply construction material.” They are also construction (and demolition) workers -- speeding up chemical reactions, breaking down food, carrying messages, interacting with each other, and performing countless other duties vital to life. Please see the paper, "Accurate design of co-assembling multi-component protein nanomaterials." 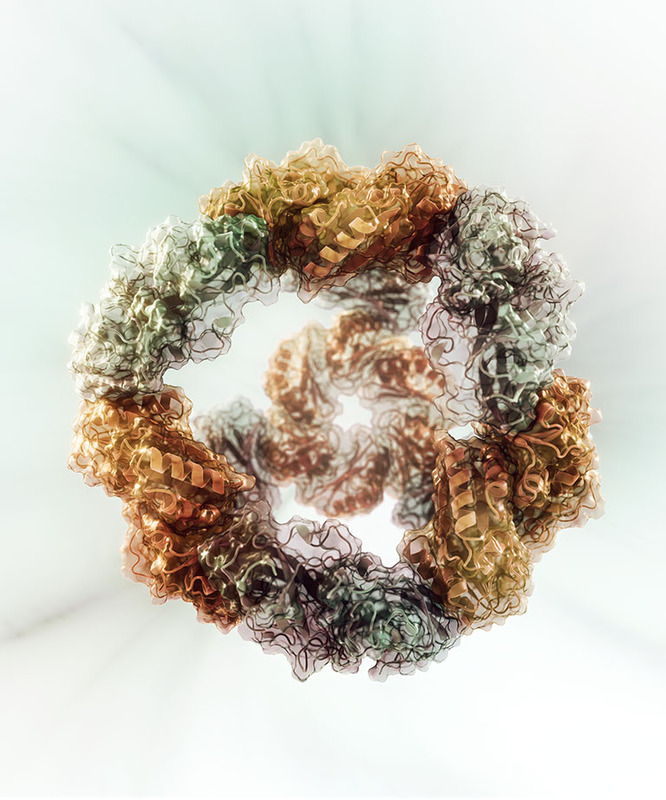 Creating this cage-shaped protein, the scientists said, may be a first step towards building nanoscale containers. King said he looks forward to a time when cancer-drug molecules will be packaged inside of the designed nanocages and delivered directly to tumor cells, sparing healthy cells. The scientists added in their report, “The precise control over interface geometry offered by our method enables the design of two-component protein nanomaterials with diverse nanoscale features, such as surfaces, pores, and internal volumes, with high accuracy.” They went on to say that the combinations possible with two-component materials greatly expand the number and variety of potential nanomaterials that could be designed. It may be possible to produce nanomaterials in a variety of sizes, shapes and arrangements, and also move on to construct increasingly more complex materials from more than two components. The researchers emphasized that the long-term goal of such structures is not to be static. The hope is that they will mimic or go beyond the dynamic performance of naturally occurring protein assemblies, and that eventually novel molecular protein machines could be manufactured with programmable functions. The researchers pointed out that although designing proteins and protein-based nanomaterials is very challenging due to the relative complexity of protein structures and interactions, there are now more than a handful of laboratories around the world making major strides in this field. Each of the leading contributors has key strengths, they said. The strengths of the UW team is in the accuracy of the match of the designed proteins to the computational models and the predictability of the results. This project was supported with funding from the Howard Hughes Medical Institute, the U.S. Defense Threat Reduction Agency, the National Science Foundation, the International Vaccine Initiative, the U.S. Air Force Office of Scientific Research, and the U.S. Department of Energy.